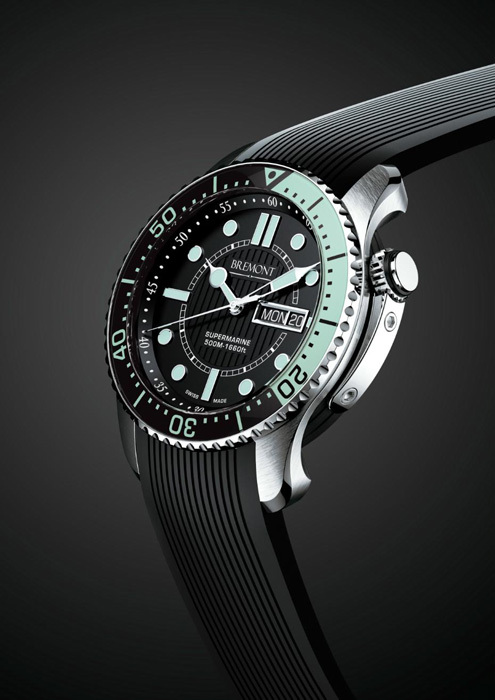 Bremont has announced the launch their first marine watch – the Supermarine 500. Following on from the success that the Company has had with its aviation watches Nick and Giles English wanted to build an “amphibious watch” that was both classical in its design and aviation roots but very effective as a diving watch. The design of the Supermarine has been built using Bremont’s unique Trip-Tick three piece case construction which gives it a water resistance depth of 500m or 1660ft, but keeps the classic curved profile of the 42mm case design which is so distinctive to Bremont. An elegant crown protector has been built onto the side of the inner barrel, and following on from other Bremont models, the watch case has been specially treated for hardness using Bremont’s B-EBE2000 technology. As with all Bremont watches the Supermarine is Swiss Made at the Bremont atelier in Biel-Bienne and houses a modified BE-36A automatic chronometer movement. Extensive testing in the UK by Bremont on this and other new models at its test facility has led to the design and construction of an ‘Anti-Shock’ movement mount to help protect the movement against large shocks. The movement is also housed inside an Anti-Magnetic faraday cage to protect the balance, balance spring and escapement from any effects of magnetisation. For clarity the bezel is being made of sapphire which covers the Superluminova C5 numbers, and the sapphire crystal covering the dial will be coated on both sides with Bremont’s usual 9 layers of anti reflective coating. The watch has been named as a tribute to the brothers love of the iconic British aircraft manufacture responsible for the Supermarine S6B Schneider Trophy Seaplane and of course the incredible Supermarine Spitfire. The Bremont Watch Company is a British company that was started by brothers Nick and Giles English 6 years ago. They offer a range of highly developed aviation inspired timepieces of exceptional quality and high aesthetic value. All watches are built at their atelier in Switzerland. place on the 17th November 2008.